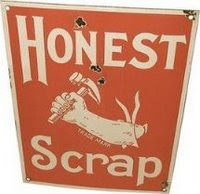 Thanks to Laura at JourneyChic AND Yansy at Designing Life for the awesome Honest Scrap Award. I have no idea what the award means but I feel very special anyways so thank you!! 1. Say thanks and give a link to the presenter of the award. 2. Share “10 Honest Things” about myself. 1. I have a mouth like a trucker, I swear ALOT. I'm trying to become more "lady-like" as the BF calls it but its very difficult for me, I enjoy my F bombs. 2. I write with my left hand but I do everything else with my right hand- play sports, use scissors, eat, etc. 3. I have a serious obsession with organization and buying containers, etc. to get more organized. One of my favorite Christmas presents was a label maker my parents gave me. They thought it was the strangest present I ever asked for. 4. The BF and I have been together for close to 6 years...or maybe its over 6 years, at this point who's counting. 5. I love dark beer, the darker the better. 6. Every year on Christmas morning I transform into a two year old. I wake up at 6:30 am and proceed to wake up everyone in the house with my shrieking and excitement. I'm that girl sitting on the floor in front of the tree hands clapping, hyperventilating and freaking out at the sight of what "Santa" brought....for the entire time we open presents. Oh and we MUST follow tradition every year or I get very, VERY upset. 7. I own the toolbox in our house. The BF has strict instructions to not touch it, ever. The reason you ask...I asked him to hand me the Phillips head screwdriver one day and he asked me what that was. I'm quite content being the handy-woman in the house. 8. I have an addiction to Starbucks- I get one every morning when I'm walking to work. I've tried to stop many times, I suppose its like a cigarette addiction. 9. I studied abroad in Madrid Spain in college and it was the best 4 months of my life! 10. I cant think of anything else, so that is all. I'd like to pass this along to all my readers since I cant pick just 7 of you and it seems that alot of you have filled this out already. I was a little scared that strange 60 year old men would show out and completely creep me out but these four lovely ladies were a great surprise. Its always nice to meet others who have a passion for the same things I do and don't roll their eyes at me when most of my stories begins with "On this blog I read..."
These girls were so much fun that we didn't end up leaving the bar till 10:15 pm- we just kept talking and talking and talking. It was like I had known them forever and they were just old friends I was catching up with. Oh, and I had my camera with me so I could take pics to blog about but somehow forgot to even take a single one...oops. Ladies we will have to do it again soon!! You're not the only one with "Christmas issues". If I stay at my parents' house on Christmas Eve, I still make them wait until I've gone to bed before they put my presents under the tree! I love that moment of surprise I get when coming down the stairs in the morning and seeing all the colorful packages. I had my camera, too, and totally forgot about it until I got home. Oh well - next time! DITTO for me on nos. 2 & 3! My dad was the same way about Christmas! I think it makes the holiday more fun for everyone. And, I will definitely come to the next blogger event! I am so sad to have missed last night, but I'm so glad to hear that you guys had fun! you're the best linds!!!! hahaha i love your honest things & you have me cracking up!! Label maker...check! Christmas morning-induced regression...check! Starbucks addiction...check! Love it! I'm clearly addicted to Starbucks. I go EVERY morning and have tried to quit more times than you can imagine. Last night was so fun and I can't wait until we all meet again! thanks for putting it together! I want to hear about y'alls get together. I love organizing... and I LOVE LOVE LOVE dark beer. Fun to hang out! We must do it again soon. I think Masa should be our spot since the bartender probably subscribes to your blog now. You are so cute. I too am pretty traditional with Christmas... it drives my mom crazy, I think. And hooray for dark beer. Congratulations on your award. The girls and I really wanted to come to your get together. Any chance another one near Christmas when the group will be home? Love to meet everyone. So glad 60 year old men did not show!